This month's Peachy Keen Stamp of the Month set is my favorite SOTM to date. I just LOVE the sweet little bear and faces in this set. 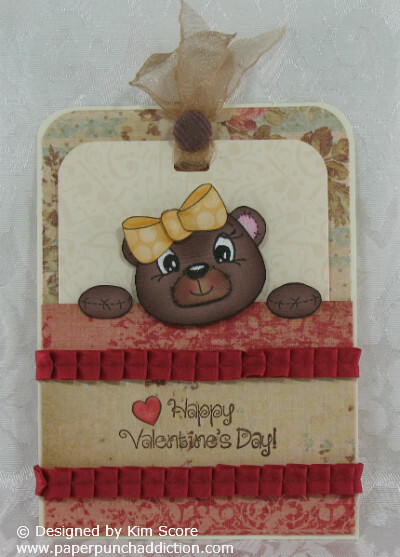 Today I'm going to show you how to create a pocket card with the added dimension of the sweet little bear head and paws. Cut a double sided designer paper 5" x 8-3/8". On long side, score at 5-3/8". On short side, score at 1/2" and 4-1/2". Cut off 1/2" wide sections on each side down to the bottom section as shown. Fold bottom of paper upwards at score line, wrap tabs around and to the back and secure with sticky strip to create pocket. Corner round the top corners of pocket. Cut a piece of coordinating card stock for backing 4-1/8" x 5-1/2. Corner round 2 top corners. Mount onto back of pocket. Decorate front of pocket. 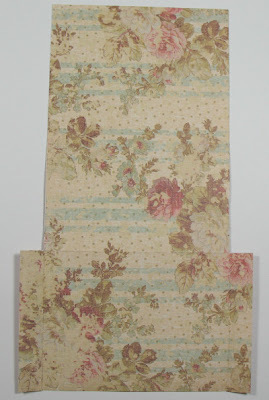 Cut a tag 3-1/2" x 5" from card stock or designer paper. Corner round 2 top corners. Punch hole in top center of tag and add a ribbon for a pull. Put tag in pocket. Stamp bear head 2 times with black ink onto cocoa card stock. Stamp muzzle with black ink onto caramel card stock. Stamp bear head with black ink onto pink card stock. Stamp paws with black ink onto cocoa card stock. Cut out entire head on first bear. Cut out only face on second bear. Cut out ear centers from pink piece. Cut out muzzle and paws. Sponge edges of all cocoa and caramel pieces with chocolate chip ink. Sponge edges of pink ear pieces with regal rose ink. Stamp nose and mouth onto muzzle. 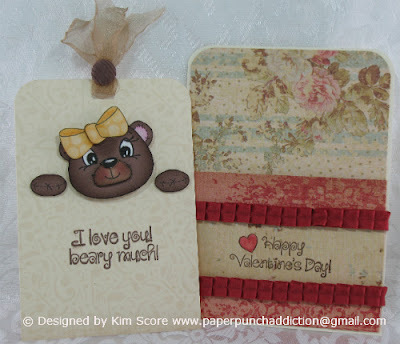 For added dimension, stamp again onto caramel card stock and cut out nose. Mount nose with dimensional onto muzzle. Stamp eyes onto face piece. Add whites to eyes with gel pen. Attach muzzle to face with dimensional. Glue pink ear pieces onto ears of full head piece. Attach face to head piece with dimensionals. Stamp bow onto designer paper 2 times. Cut out entire bow on one. Cut out only center on other. Sponge edges of bow with coordinating ink. Add center of bow to whole bow with dimensional. Glue bow onto bear head. Attach bear head and paws with dimensionals to tag in pocket. Position so that head and paws overlap pocket edge slightly. Remove tag from pocket and stamp greeting on tag. Just darling Kim! LOVE these cute new teddy faces! 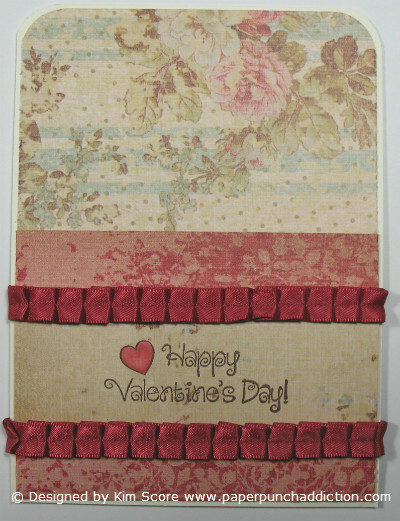 I love how this card came out Kim! Very cute, the face is adorable. Adorbable and cute to boot just abt covers it Kim. Great card idea...Love the idea.